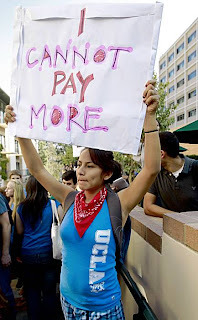 Please note links featured in the blog's other columns: SAVE's petition to postpone fee hikes, and a survey and further information on travel to the Regents' meeting at UCLA Nov 17-19. The UCSB student coalition demands are here. See also the first issue of UC Solidarity Notes, a student-worker joint production. I am a faculty member in a research unit receiving a large amount of extramural and especially federal funding. We are primarily a graduate department, and only about a third of our teaching is currently at the undergraduate level. Since we offer few service courses, we have few TA positions available to provide a stipend and tuition remission to our graduate students. Instead, most graduate students are funded by federal grants and fellowships of various sorts. In fact, every grant proposal submitted out of our research unit is expected to include a request for graduate student funding. The graduate students in our unit not only do research for us, but they are the primary constituents of the courses we teach. The PIs in our research unit also support through extramural funding a very large number of postdocs, project scientists, and technicians. The majority of our budget comes from federal research grants, and core UC funding is only 14%. Unfortunately, it is this 14% that produces 90% of our headaches. 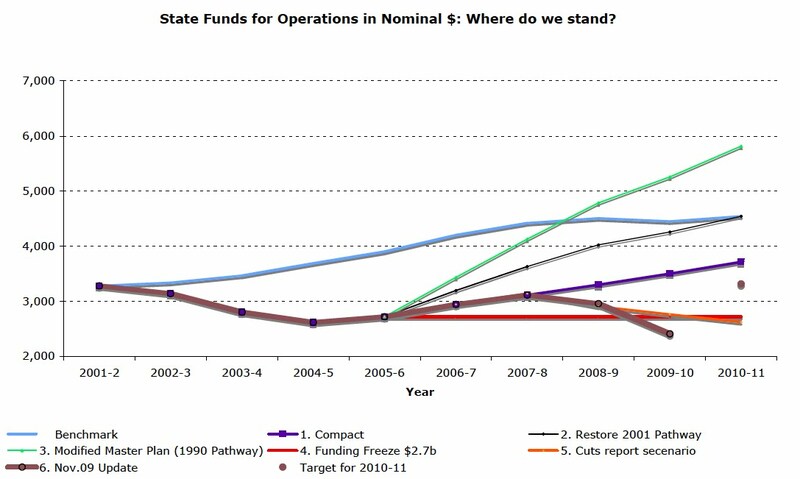 The more selective cuts that occurred during the previous recession hit our research unit harder than the rest of UC, so we are coming into the current crisis with scant buffer. Many staff members have already been laid off, and most institutional lab support has already been eliminated. The remaining UC funding is devoted to long-term matching commitments to federally-funded research infrastructure (which must be paid to maintain our central programs), salaries of support staff for core academic and business office functions (which cannot be reduced any more), and salaries of PIs. The last category, in fact, makes up the majority of our UC funding, so there is probably no way to accommodate further cuts without reducing faculty salaries even more than is the case with the current furloughs. The suffering from budget cuts has been disproportionate across our research unit. Those PIs who were already supporting their research staff and lab facilities exclusively from extramural funds were not hurt when institutional support was removed. Those people paid 100% from extramural funds were unaffected by the furloughs. Those faculty members with enough funding to pay themselves on furlough days (two thirds of us) have not experienced any salary reduction. The availability of extramural funding may explain why faculty in the sciences have not been as upset about the handling of the UC budget crisis as faculty in the humanities. In fact, I heard a colleague state that it was a victory for shared governance that we were able to prevail upon UCOP to spare extramurally funded people from the furloughs. UCR Mobilize is a small but very active coalition of students, faculty and staff that's been doing actions since the September 24 Walkout. We meet weekly on Wednesdays and coordinate between faculty, student groups and unions. The unions are already organized and have been fighting this fight for a long time. Concerned Faculty of UCR has been reactivated recently (it was originally formed to support labor actions at UCR). Last week, Chris Chase-Dunn, Karthick Ramakrisnan and I called a meeting about the Gould Commission of the Future visit to UCR, and 40-50 faculty attended. We've been able to get the head of the Academic Senate to attend our meetings and join efforts to reach faculty. The next meeting is Friday, November 13. At the November 3 Gould Commission "listening session," faculty from Concerned Faculty questioned the credibility of the Commission and the market thinking of its charge, and raised issues about access and the impact of privatization on our students. Outside the pointed criticisms of the Commission, speakers affirmed UCR as a model for the entire UC, a campus that reflects California and produces "excellence" with diversity. On Monday, November 16, UCR Mobilize plans two Teach-Ins (12 pm and 6 pm) to educate the UCR community about the crisis, its effects, and resistance, and mobilize for the November 17-19 Regents' meeting at UCLA. Faculty, staff, and students will speak. A large contingent of UCR students, union members and faculty will participate in the actions on Nov. 18-19 at the UCLA Regents meeting. 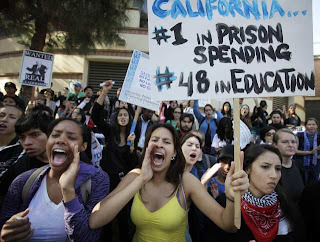 We're planning a series of events for the winter, leading up to the system-wide Day of Action on March 4 (Sacramento) and the Regents' meeting at UCR on March 17-19. We're building alliances with CSU and CC campuses in the area, and I think there will be some joint actions. The students have a web site and we have the beginnings of a web site for UCR Mobilize. We received a query from Jessica Luk, and would appreciate receiving more news about new professional degree fees. Similiar increases have been proposed for Berkeley's School of Social Welfare. I'm a graduate student in the Masters of City Planning program, and our department is looking to levy a professional degree fee (PDF) on incoming students in the amount of $6,000/student/year. Unlike the business and law schools, which are justified as falling on higher incomes upon graduation, this PDF has been created to cover budget short-falls. Are the Regents leveraging the potential for higher cuts to induce departments to fundraise, and in this case, at the expense of the students and WITHOUT student input? This is tragic, and I wonder if there are similar movements going on in other departments/schools? On Friday, November 6, the traveling medicine show called UCOF arrived in La Jolla to "listen" to the UC San Diego community. Commission members included UCSC Chancellor Blumenthal, Cynthia Brown, Mary Croughan, Keith Williams, CFO Peter Taylor of UCOP, and student regent Jesse Bernal. The audience peaked at about 125 but was down to less than 100 by the time public comments began. There were approximately 12-20 faculty at the most (not counting the faculty/administrators who made formal presentations). --Blumenthal's remarks were mainly about downsizing. He said not all campuses will have all programs, and coined a new term "inter-institutionality" that he claimed will replace interdisciplinarity in the 21st century. --Croughan talked about "industry engagement." --Williams talked about on-line education. --Taylor actually spoke about the possibility of working for a "dedicated tax" for higher education (probably the most positive note from any of the commissioners). --Bernal did not advocate for students as much as show that he is quickly learning how to use bureaucratic rhetoric. Presentations by UCSD administrators were weak, ranging from banal boosterism to a pitch for more graduate and fewer undergraduate students (or we'll lose our prestige) to a fundamentalist reading from the privatization bible--more foreign and out of state students for revenue (Dean of our Business School, as you might have guessed). Staff presentations, on the other hand, were excellent. They advocated for students, argued for an "education model" instead of a business model, etc. It was pointed out that the absence of any regents made it hard to take the exercise seriously. The most valuable intervention was by one of our building maintenance carpenters who explained how he and his crew have to repair all the shoddy work done by private contractors hired by the University, thereby costing the University more money. He talked about lay-offs and shortened hours in his department. He talked about his life as a worker who had dedicated himself to UCSD and his son, a first generation college student in the UC, who was now in danger of having to drop out for financial reasons. Very powerful. Public comments in general were good. One student pointed out that for many disciplines Blumenthal's notion of inter-institutionality will make interdisciplinary work on a single campus nearly impossible, a sharp irony given the endless UC rhetoric over the last decade about the latter. Another student said she felt betrayed by the UC system because of fee hikes and told the commissioners she did not trust them. There were about 12-15 public comments each limited to one minute. Very little exchange with the Commission afterwards. Croughan said regents did not attend because they will be visiting campuses later this academic year. Taylor was somewhat perturbed by an audience member's reference to Bob Meister's claim about how student fees are used. The Commission members then went off to have longer meetings with UCSD Senate committees. In short, a kind of theatrical non-event for the campus community at large--another episode of the Done Deal. Having learned that Berkeley's Department of Intercollegiate Athletics is running losses that the campus administration was covering, the Division Senate voted 91-68 for an immediate end to loans and subsidies. The Resolution starts on page 5 of the Notice of the meeting, and the Division had posted background materials. ASUC also passed a resolution calling for an end to the use of any student fees for the "direct or indirect benefit" of Intercollegiate Athletics. The Berkeley Senate has also posted background financial data on Berkeley athletics and the history of silently covering its financial losses. The phones are being turned off. The garbage is no longer being removed from offices. Student fees are rumored to be going up by 35%. Faculty salaries have been slashed by 4-10%. The entire place will be closed from mid-December for weeks. Dozens of chairs at the University of California, San Diego have signed a document proposing the entire closure of three smaller UC campuses because we’re not really research universities and we cost money that could otherwise be allocated to the flagships of the UC system. That’s life at UC Riverside just now. A superb Executive Vice-Chancellor/Provost has resigned because she won’t administer these brutalities. Meanwhile, managerial homilies emanate from senior management in regular “letters” to the “community” using clichés of the kind I generated as a speech-writer to boring bureaucrats and businessmen in the mid-1980s, like “Doing More With Less,” “The Riverside Opportunity,” and assorted inanities. Are people truly still paid to do this, and are there any readers out there who are seduced by them? My own department has seen the other senior professors leave; a high-quality junior faculty member denied tenure; and rejections of incremental advancement for other deserving faculty. It’s a very tough time in what used to be the jewel of public higher education. As the flotilla sinks, people flee to safety. Faculty are looking around, and other schools are looking at them. The University of Texas system is rumored to be using a massive fund to hire talent. The University of Southern California, an immensely rich private school here in LA, has lost a billion dollars in the value of its endowment since 2008, but is still much better-off than a decade ago. This is a special opportunity for it to raid the UC for the best scientists in the world (the cost of good science is always a problem for private universities to meet, due to the high initial costs and ongoing refurbishment of equipment). The question is how bad the long-term impact will be: whether counter-cyclical policies to retain key faculty will work if this is not a dip in the Cali economy but its demise, at least in terms of transfers to public service from the private sector. Put another way, even if the state had the wisdom to sustain the UC through the crisis until tax receipts picked up once more, would there be any point if the crisis in fact has no end point but is rather a brutal transformation that shrinks the public sector irrevocably, thereby finalizing the longstanding wish of the Republican Party to “starve the beast” (the “beast” being the population, understood as those receiving the support of tax-funded programs)? You can’t blame students for looking on aghast and hoping it just gets better, or taking direct action such as occupying Dean’s offices. You can’t blame the professoriate for being struck dumb and hurting but doing nothing collectively, or organizing vigorously and criticizing all levels above them. You can’t blame the staff for refusing to accept furloughs thanks to union opposition, or wishing the union would let them do so and thereby protect their jobs. It’s a wildly contradictory time, when all of the above is happening. So unlike your other foreign correspondents, I’m telling a story of doom and gloom just now, as the adventure of a system built with such hope just fifty years ago, that quickly produced dozens of Nobel Laureates, pioneering novelists, ethnic-studies innovations, Marxist-feminist enclaves, and medical schools the envy of the world, comes to a shattering end. To be here now is to be present at a turning point in educational history, when pages are torn from a playbook and lives are torn asunder. Dedicated scholars who had made the decision to join the ranks of the gentried poor rather than follow mammon find that the supposed trade-off—you can pursue your research secure in the knowledge that your basic welfare is secure—no longer applies. It’s a meltdown. On Monday, November 2, UCOF stopped off at UCI - a very good post to this blog on the same day summarized this dire event. At one point, the panel moderator asked the audience for ideas on how to lobby the California Legislature - ideas were needed to advocate on behalf of the UC. My colleague next to me was incredulous, "that's not our *job*!" Yeah, but whose job will it be? This question posed to the audience came after the panel detailed the strategies that each of their own committees were considering in terms of UC fundraising. External private and federal government funding as well as private industry partnerships were elaborated upon as if we were all having a pre-determined agreed upon conversation that imagined an already privatized university. There was no pretense to the absent role of the state in the public university or even the public sector. This was a Done Deal. Until a couple folks from the audience got up and implored the commission to rethink the role of state funding. Chancellor Drake was entirely amenable, I must say. Yet, it is extraordinarily disturbing to be in the midst of a dangerous and changing definition of the "public" where we must beg our own leadership to reconsider telling the state to do its job. It's even worse that the state's job has become debatable. But truly the stupidest thing of all is that as an audience at these meetings we are expected to offer up suggestions on how to complete our obsolescence for them. At every turn, Chris Edley posed questions to folks - who were narrating the dire conditions of their environment - that essentially asked them to figure out how to downsize themselves even further: What should the size of a graduate program be? Should campuses have differential financial aid? Should Merced get less? Pathetic. So what gets advocated in the context of the Done Deal? Of course, what should: restructuring the extraordinary inequity of the CA tax structure, Prop 13, minority rule in the Legislature, tax the rich - yes, I said it! - and the obvious list goes on. But more recently since September 2008, the successive CA budget agreements produced extraordinary slashes in the public sector while creating new tax breaks for corporations. 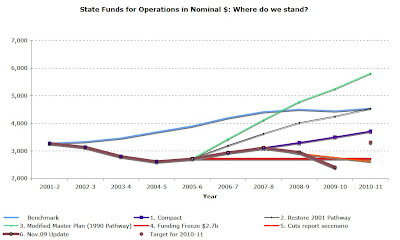 The California Budget Project estimates that over $8 billion in revenue was lost in the Sept 2008 and Feb 2009 agreements alone. This race to the bottom for foreign direct investment while slashing the public sector is classic Structural Adjustment, only the incredible thing is that California is gleefully agreeing to this, whereas historically, sane nation-states only complied while kicking and screaming and dying. So, aside from Mark Yudof and the Regents having their pity party about the lameness of the Legislature, will they ever chain themselves to the gates of the University and demand that corporate tax loopholes be reversed, that California should have a progressive tax system, that Prop 13 should be abolished, claim that this is all robbery and demand that the public deserves to be restored to something resembling an entity that has a social contract with the state? Not in a million years. Not in a million years because those corporate tax loopholes and the tax system and our lame-o Legislature are all doing the Regents a big favor. Lets' take a look: the industry most commonly represented by the Regents is finance/investment banking /securities; the second most commonly represented industry is large-scale commercial real estate. Others include business and regulatory law, defense, conglomerate corporate media, and corporate/foundation philanthropy. When you read each of the Regent's biographies, only three voting members, if I am generous, out of 19, plus Yudof can claim any experience in education. The ones who have no experience in education do not even mention the word "education" or mention it as an interest or concern in their bios. So, while these UCOF meetings do the remarkable thing of actually constructing a sane conversation over the disappearance of public education - as if it is perfectly natural and ok by all of us - how will it be possible to advocate for education and the restoration of the public sector in the face of the Done Deal? Perhaps a People's Commission on the UC is in order, one that could refuse the terms of this conversation and one that could both compete and discredit what we all fear to be an already pre-determined outcome of our future. I've posted reports on the most recent appearance of UCOP people and issues at UCSB. They are worth reading. 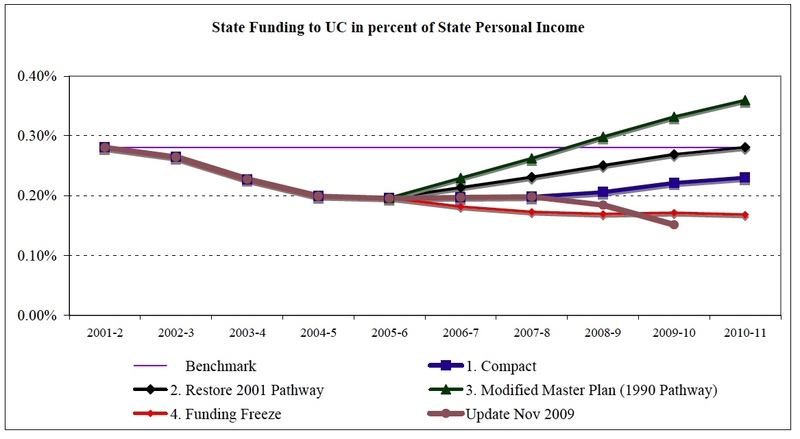 For a few years, UCOP was saying that employees needed to restart contributions to the pension fund in order to secure UC's great "defined benefit" pension. Now, the Task Force is considering whether to get rid of DB pensions, with various permutations, even as they are still planning to restart contributions. This would continue UCOP's central achievement this year - pay more, get less - and would eliminate one of the best things about UC employment - some would say now the only good thing, because security in retirement compensates in part for years or even decades of sub-par wages. Folks should be following these developments carefully. Thanks for agreeing to serve and for allowing the opportunity to comment. I have one overriding comment that stems from my research and teaching across disciplines. Students increasingly approach their degrees as means to a prescribed end. I see this in social and natural sciences, medicine, law, engineering and less so in humanities. The pressures for students to be so oriented are immense. However, I have found that only the top 1% of those following a prescribed professional path, adequately imagine their discipline, their chosen field, their research question, as part of a larger body of intellectual pursuits. Instead, they learn how to think based upon the perceived - often accurately so - dictates of their aspired to profession. The same could be said of research strategies whose horizon are simply the next grant or next publication. The risks faculty take are few, because we can ill afford it. Our reward structures are based upon market forces for certain kinds of knowledge. While we could cater to this 'market demand' in each of the 5 key areas of the future UC, I submit that we do a disservice to our state when we allow market forces to shape what education and research have become. My vision, and I hope to persuade here, is that education and research are inherently risky, curiosity driven endeavors. Only under these circumstances, structurally supported, can students be exposed to and appreciate the breadth and depth of human intellectual, social, cultural genius. And only under conditions of risky curiosity driven pursuits, can innovation spring. I am deeply saddened to encounter students and colleagues who cannot argue the merits and flaws of their field of study with any conviction, let alone informed by philosophical, historical, social or empirical connection to debates in fields other than their own. This is not education. The future of UC requires that the professorate and students swim in a soup of ideas untethered to a return on investment (ROI) strategy. If we free ourselves from this intellectual straitjacket, we can never to the scale and scope to which our premier UC campuses aspire. The Gould Commission came to UCI, with our own Chancellor Drake, Cynthia Brown, Mary Croughan and Chris Edley presenting the Commission's structure, its mission and its willingness to listen to a sparse audience, perhaps sixty profs at most with a smattering of students and staff. The Commission asserted that the policy recommendations that they were going to draw up were not to be reactive, but rather to be authentic projections of the better UC that we should become. As expected, Edley was by the far the most aggressive member of the Commission, cross-examining the former Chair of our Faculty Senate in his best lawyerly style when she insisted that the UC should not have differential tuition across the campuses. He turned it around and asked her if UC Merced should offer better financial aid, and if financial aid should not be differential across the various UC's. Jutta Heckhausen paused and said she had not thought of this, and considered UC Merced a special case. I thought that Edley was supposed to be LISTENING, but obviously he has a few ideas of his own that he isn't keeping so secret. At one point, he asked Carol Burke to go home and think about how big a graduate program at UCI should be, and asked her to email him the answer when she had drawn her conclusions. To Julia Lupton's eloquent statement about technology and distance learning as well as distribution of resources for instruction rather than on-line ed, Edley replied, "Of course our initiative will serve professors and instructors first." I was almost reassured, when the gloves finally came off and he expressed exasperation in response to my brief statement about the Commission's managerial ethos, which seemed to neglect an intellectual rationale or vision for the UC: Edley, "I've been in California almost five years four months and twelve days, and I am tired of the ROMANTICIZATION of the UC." To paraphrase, he went on to tell us we aren't all that, and that we need to be remade and reinvented. He was also responding impatiently to an Assistant Professor of Anthropology who had mentioned that the Socratic method had worked for 3000 years and that sometimes, education at the University took place simply as conversation in his office; Ann Van Sant of English suggested the Commission may not have the instruments to measure such interactions: Edley: "You just can't compare the excellence of teaching 400 students with the excellence of conversations you are having with three of them!" I WISH I had recorded his controlled rant about how blind we all are to our limitations, and how deluded we were about our past. Now there are enormous problems with the UC, but when one of the Gould Commission's members is already "tired" of our alleged self-mythologization then, the power that he has can indeed be wielded to destroy an institution's legacy in the name of his version of our futures. In addition, he urged us to have "charity for UCOP" because if we knew about how dire the budget situation was, we would be grateful indeed about how much money we managed to get from the State considering the depth of all the cuts that have been made. This seems persuasive on some level, but I wonder if Edley or UCOP recognizes what it is like for the rest of us. I would like the admin to be a bit more grateful that we are all working at a feverish pace at less pay, watching our community's most vulnerable members lose their jobs as staff and clerical workers live in fear of a pink slip. If I saw a bit more understanding of life on the lower echelons, I might be more inclined to feel "charity" for our leaders. I am already a philanthropist of my own time...to the tune of 7% of my paycheck. Drake seemed to be genuinely distressed when one speaker spoke of how poorly her students wrote and commented that large lecture courses of 400 were perhaps not the best places to learn the skills we assume college students should possess...One emeritus Medical prof suggested that what we should be offering as a University is something more general and broad than simple professional training. Yes, but Edley's 400 haunts us all...Managerial solutions have taken on the allure of a sovereign heroism...and the rest of us are seen as impractical malcontents, unable to fight the right wars, renounce our ideals or our romanticism and take on the new realities...Athenians in short. November promises to be a tumultuous month in the UC system. The beginnings of the Gould Commission’s flyovers of campuses, the upcoming Regents Meeting and the vote on increasing fees, the planned protests by staff, students, and faculty, all indicate that the month will be crucial moment in the re-definition of the University. Nothing will be solved in November, of course. But UCOP's and the Regents' vision of what the University is and what it should look like has come increasingly into focus. Between the Fee increases and that clarified focus, we will have both short and long-term tasks. We will need to offer an alternative vision of the University--how it should be organized and governed, what its ends are, and what is its relationship to the larger public—in short, a vision of Higher Education as a Public Good. I should make clear that although I am focusing on UC here, I don’t think that either the problems or any solutions are limited to UC. What is at stake over the next period is the future of the community colleges and CSU as well. We should be clear what we are up against—both in Oakland and in Sacramento. Indeed, the ties between Oakland and the Governor are part of the problem. President Yudof’s latest public relations attempt to justify his proposed fee increases puts to rest any notion that he is capable or willing to defend the notion of higher education as a public good. In it, he continued his long-standing mantra that the State is an “unreliable partner” and that the University needs to shift the burden of its funding more heavily onto fees and private donations. In order to do so he refers to “the honesty of Mike Genest, California's state director of finance, who agreed with me — in public — that the state has become an unreliable partner.” President Yudof would like to portray this as an unfortunate and unchangeable situation. But to do so demands that he treats Genest as a neutral broker. But he isn’t. Instead, Genest, as Governor Schwarzenegger’s finance director, has been at the forefront of the governor’s program to redistribute the state’s burdens regressively. Genest, after all, famously told reporters, that “Government doesn’t provide services to rich people,” indeed, “It doesn’t even really provide services to the middle class.” Neither the rich nor the middle-class, of course, benefit from fire or police departments, clean air or water, roads, education, public health, or any other government programs. The Parsky Commission proposals—which the Governor, and one presumes his Finance Director has endorsed—will shift the tax burden of the state in a powerfully regressive fashion and lower the state’s revenues at the same time. Yet Yudof has chosen to ally himself with this world-view. If he honestly thinks that this is a neutral and objective—rather than an ideologically driven—view of the future of state government then it is no wonder that he has proven so incapable of articulating an effective defense of public higher education or of the necessity for state funding. To be sure, Yudof is most likely only doing what the Regents would like him to do. The Regents themselves have shown no inclination to break with the Governor. Neither the Regents nor UCOP will ever point out that the emperor has no clothes. So where does that leave us? In the short run, it seems to me that at the minimum we need to try to prevent the present crisis from defining the nature of long-term policies. There are numerous ways to prevent the rushed redefinition of the University. But let me suggest a few. First, the Regents should never have put the fee increases on the table without a firm commitment from the State that as the budget improves the cuts would be restored and the fees could be lowered. But they can, without such an agreement, formally make the fee increases temporary. Making the fee increases temporary, will not, I realize, help students in the present crisis. But it may help stop the notion that they are ATMs who can be pressed for more money on the way to de facto privatization. We should insist that the Regents to provide actual data on how much money will be raised by the fees with guarantees (with specific dollar commitments) that the increased costs will be matched for students whose parents earn up to $100,000. Second, it needs to be made clear to the Regents that they face a genuine crisis of confidence and legitimacy within the University system. The Gould Commission needs to be slowed if not reconfigured. The notion that such a report can actually be delivered by March is ludicrous unless the plans have already been formulated. Local committees are already complaining that they do not have the data they need, administrators are providing them with a pre-set menu of choices (usually which programs to cut), other committees don’t even have their memberships set, and the notion that the Commission is going to spend 3 hours on each campus reveals, more clearly than anything yet, the contempt being manifested for the campuses and the people who work there. If there is going to be a discussion and debate over the future of the University it should be one that is open, from the bottom up, and in the best traditions of the University. It should not be done by a stacked commission looking for ways to let funding streams determine the shape of teaching and research. Finally, we need to publicly challenge UCOP’s practice of defining the University primarily though its overall budget and the private/public partnerships that occur in the Medical Centers and some of the research activities. I am not advocating some attack on the Medical Centers or an attempt to undermine independent research activity. 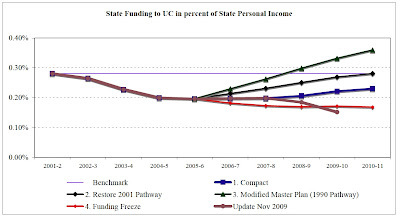 But in so far as UCOP is emphasizing and protecting those activities instead of the Colleges, in so far, as they claim that the State provides only a small proportion of the University’s budget—as opposed to stressing that the State provides a majority of the budget that goes to educational costs—they are accelerating an argument and program that suggests that UC does not need the State. In the end, however, we will have to articulate our own vision of higher education as a public good. The Master Plan conceived of higher education as a means of social mobility, as a source for public debate and creativity, as a mechanism for developing new ideas and approaches to the natural and social world, to the arts and the humanities, and to the State’s responsibilities to help individuals live a full and meaningful life. In a word, the Master Plan insisted upon the State’s responsibilities to help students become citizens engaged in the world in the largest sense. This Master Plan’s vision has been abandoned in multiple ways. Most obvious have been the erosion of the University’s commitment to access and its explicit and implicit redefinition of its responsibilities under the master plan. But it has also been abandoned in our narrowed expectations of what higher education should do and what we are preparing students for. In so far as we allow our jobs to be conceived as preparing students for work or for graduate training we have already lost an important battle to professional deans who think that on-line education can take the place of classroom dialogue. And in so far as we allow the value of research to be determined by its immediate usefulness to the corporation or the state we devalue the development of the imagination—whether scientific, humanistic, or practical. The defense of higher education needs to be made on the basis of the full development of the human imagination and of public higher education on the full development of the capacity and experience of the citizen. Higher education as a public good means more than just higher education for the public good. The attack on public universities is, as Chris Newfield has argued, part of an attack on the notion of a public good in general. Defending the notion of a public good may be the most difficult task ahead. It will mean overcoming decades of ideological attacks, of erosion of a sense of shared responsibilities and burdens, and of deliberate attempts to imply that any public program is doomed to failure and inefficiency. But in order to prevent the University from becoming defined by its private flows of money and the burdens placed on students, staff, and faculty, we will need to overcome the public’s disengagement from the notion of the public itself. I do not know what to suggest on this last point. And I recognize that my short-term solutions may appear too little, too late. But I offer them in the hopes that others will propose other ideas. We need more ideas on how to counter the present crisis, ideas that can counter the way that UCOP and the Regents have defined the problem and its solution. And we need them fast.